This four-stamp issue, TT Winners, features Joey Dunlop, Steve Hislop, Ian Simpson and Ian Hutchinson, who, between them, have achieved more than 50 TT victories. 2017 marks the 40th anniversary of Dunlop’s first win, Hislop’s 30th, Simpson’s 20th and Hutchinson’s 10th. The stamps, designed by local business Isle of Man Advertising and PR, feature photographs of each rider during the race that they took their first win. The TT Winners stamp issue was released on May 26 to coincide with the start of TT fortnight. The issue is available inside a four-side presentation pack or on a First Day Cover, postmarked with the first day of issue. Both contain additional photography, including pictures taken by legendary road racing photographer Stephen Davison, and the story of each first win written by David Wright, author of six books about the races and a marshal at both the TT and Manx Grand Prix for two decades. They are available in both mint condition and cancelled to order sets. Isle of Man Post Office has also produced a highly collectable set of four stamp cards featuring the designs, priced just £2.50. Gary Dunlop, Joey’s son, added: “The Jubilee Classic TT, 40 years ago, was the beginning of an incredible success story which saw dad take 26 wins, a record which remains unbroken today. 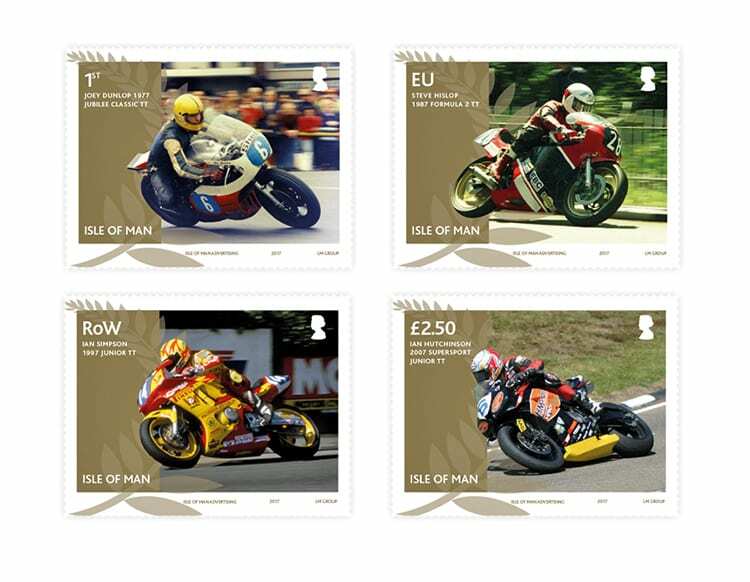 I think it’s brilliant that the Isle of Man Post Office has commemorated his first win like this, it’s a wonderful record of an important day.” TT Winners can be ordered from www.iomstamps.com.